Only another couple of weeks of river coarse fishing to go but at least the possibility of a bass or mullet down at the coast is now getting more realistic. 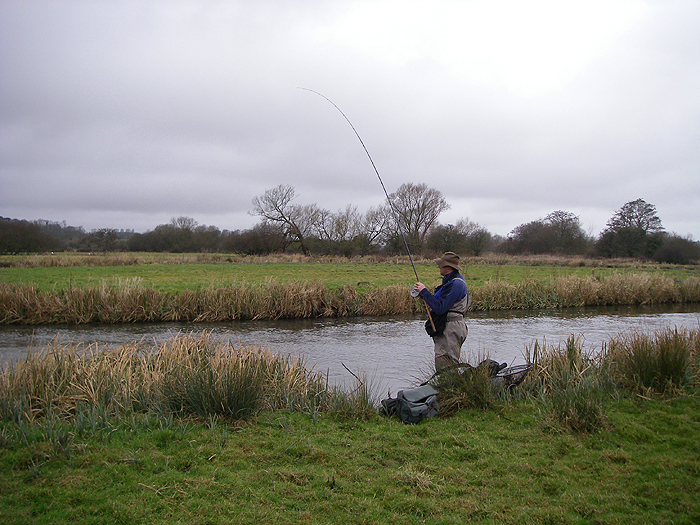 Anyway, when my pal Richard Gardiner emailed and asked if I fancied an hour or two at the river I was keen to try. I hadn't seen Richard for months so it was good to have a chance for a natter and to catch up with the fishing news. To be fair the conditions looked a little 'iffy'. It had been the usual one day fair-one day rain and the river was up and down like a yoyo. Nevertheless we went. I arrived ten minutes before my pal and set about trying to catch a couple of pike baits. 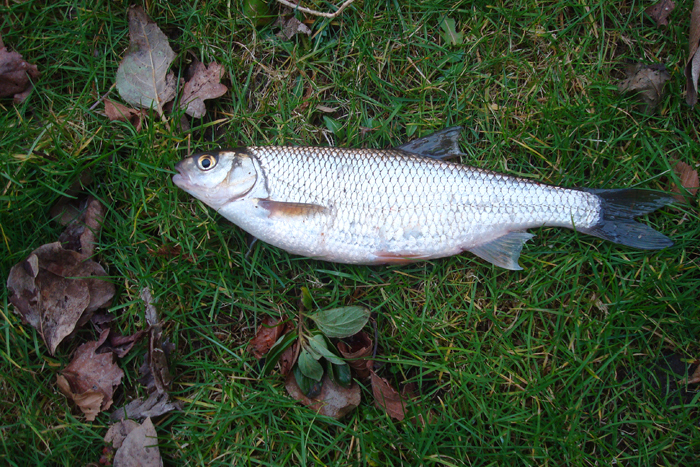 A day or two earlier I'd done exactly the same thing - float fishing with maggots - and caught some stonking great dace. This time however the fish were harder to come by and I only managed a few smaller specimens interspersed with big fat minnows. I had been catching the dace from a slack pool downstream of a closed hatch and the larger ones were were almost all fat, slippery females. Dace spawn early in the year and I think that this was a pre-spawning aggregation away from the male fish which would already be waiting in the streamy water of gravel bedded shallows. When Richard arrived I decided to have a go for a pike while he began trotting maggots in hope of grayling. At first we both struggled and for an hour or more neither of us had a touch - even though it had been a mild night and the water was not too coloured. Eventually my bait was taken. The pike whipped the float under so I tightened to try and see how big it was. Disappointment! 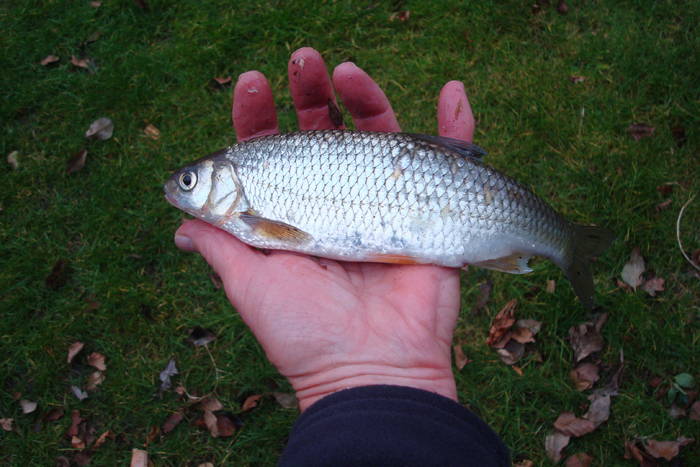 This one couldn't manage my bait and was simply carrying it round in its mouth. I lowered the landing net into the water and tried to steer the pike in but it let go when it saw the net. I walked back up to see how my pal was doing. After a biteless session at his first spot he'd moved to another nice glide and he said he'd just had a bite and missed it. I stood watching as he trotted the stream and after five minutes or so he had a second bite which again was missed. By now Richard was becoming a bit frustrated because it didn't look as though the fish were exactly 'mad on'. I said I was going to try another pool for pike before I packed in and set off trudging through the wet field. I'd only gone about fifty yards when I was called back by a shout from my pal. I grabbed the camera and trotted back to see him playing a good fish. 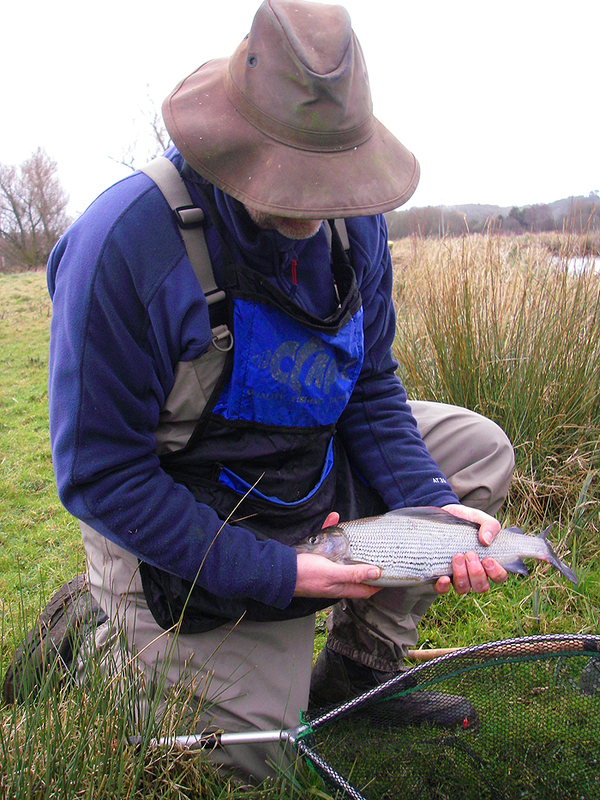 After a bit of a struggle he netted a fine grayling of well over two pounds - fantastic. I went on to try for pike but didn't have any more takes. 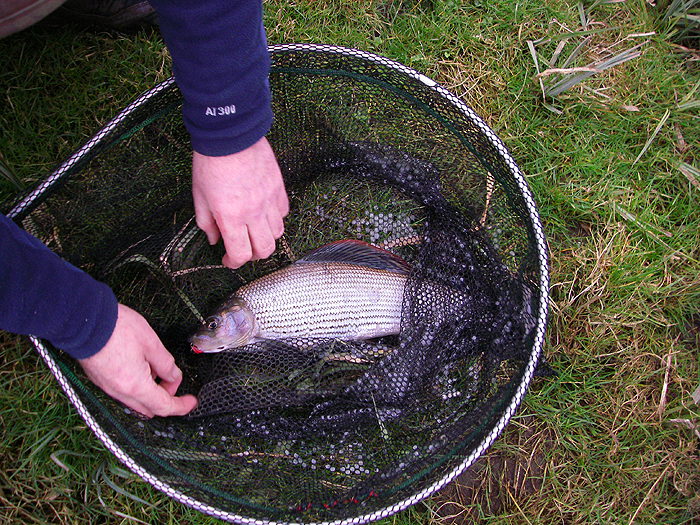 Richard told me that he'd had a second grayling not quite as big as the first one so all in all an entertaining afternoon.